When in a pinch, my mother would often make a chicken and stuffing bake. 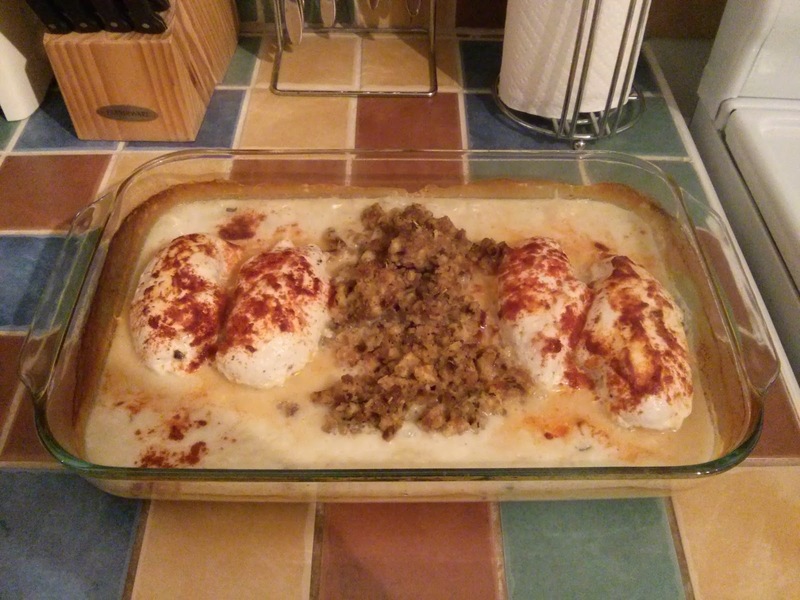 She calls it "chicken tonite". 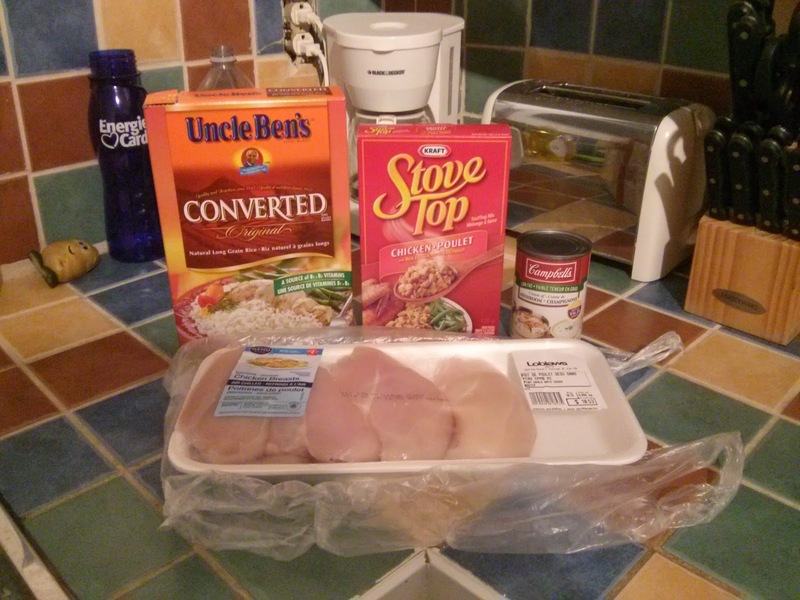 It's super easy, quick and can somewhat be used as a thanksgiving dinner type of meal. 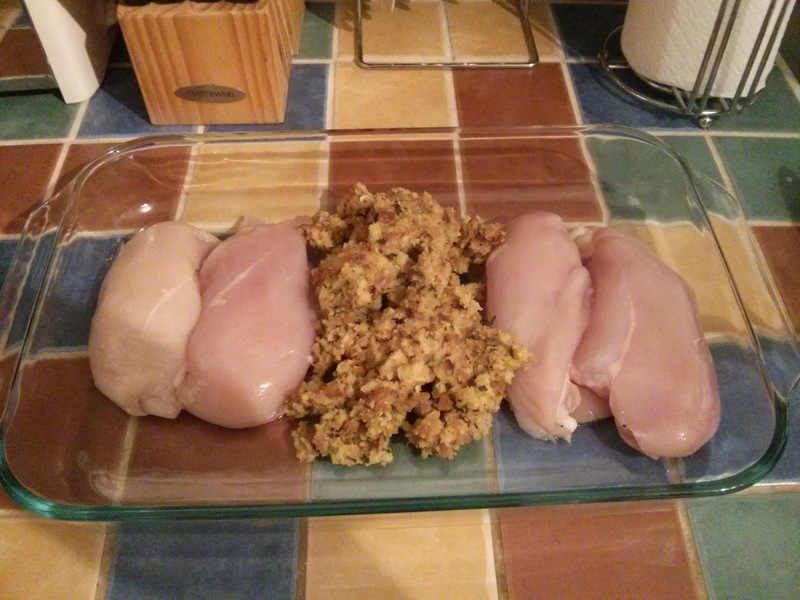 I mean, you have your two most important ingredients: poultry and stuffing. That's the basic thanksgiving dinner right there. I always had this dish with rice and I think it's the best option. The dish is made with a cream of mushroom as a sauce and it's just delicious mixed in rice. Anyway, let me show you what I'm talking about. 1 can of Campbell's cream of mushroom concentrate. Before you start, set your oven at 400F. 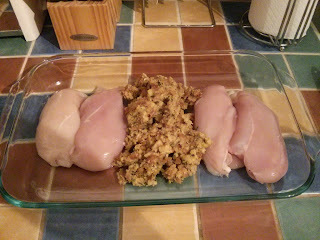 Then, first prepare the stuffing as per the directions on the box. That's fairly easy. 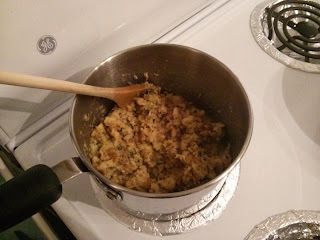 It's just a matter of bringing a small amount of water to a boil (I think 1/4 of a cup or something like that) and then just mixing in the stuffing, remove from heat and fluff with a fork. Then set that aside. 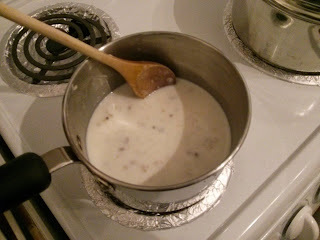 Mix the one can of cream of mushroom and one can of milk. (I mean fill the can of soup with milk.) Then mix them together over medium low heat. Just enough so that it's blended properly and there are no more blobs. 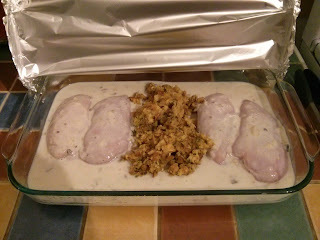 In a large Pyrex glass dish, put the chicken breasts on each side and the stuffing in the middle. 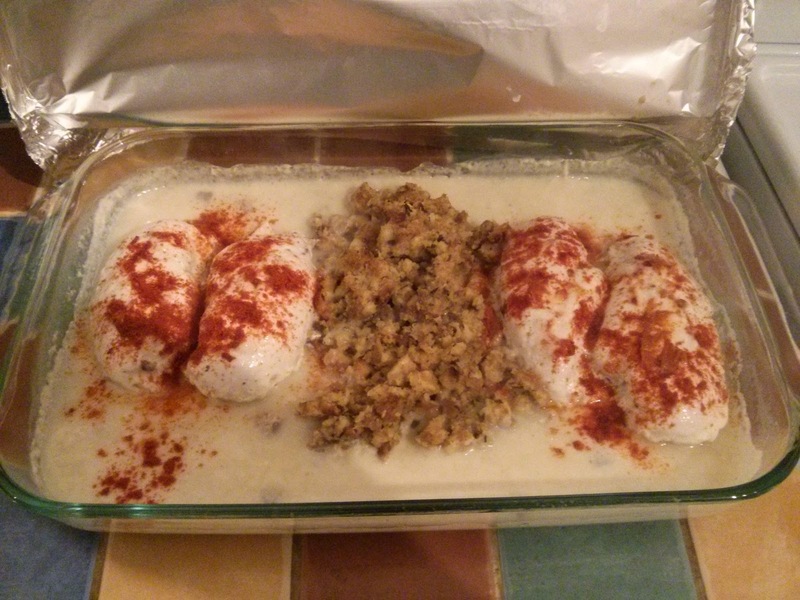 Pour the cream of mushroom over the chicken breasts, but not the stuffing. Then cover the dish with aluminum paper. Put it in the oven and set the timer for 20 minutes. While the chicken is baking in the oven, get started on the rice. 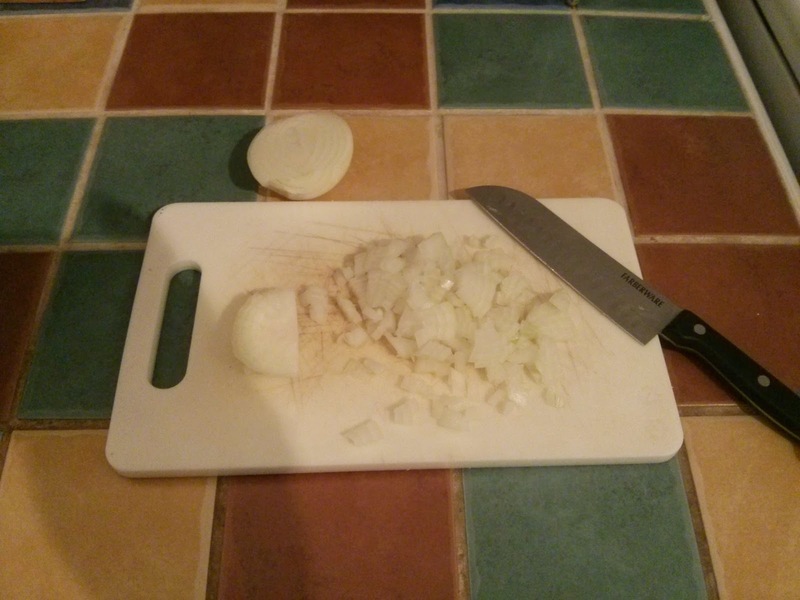 Finely chop the small onion. In a large pot over medium heat, drop about 1 large tablespoon of margarine or butter and let it melt, then add the onions and cook them until they start to brown and are soft and translucent. Then add 4 cups of water and bring to a boil over high heat. 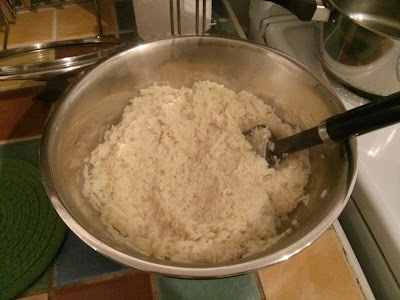 When it's boiling, add the 2 cups of rice, lower the heat to let the water simmer, cover and let cook until the rice is fully cooked. You shouldn't have to drain any water and the rice will be cooked to perfection. 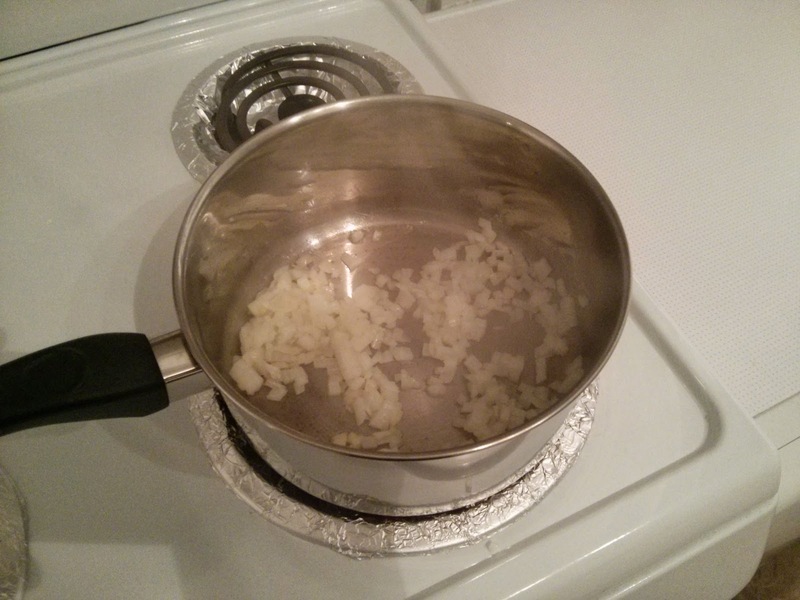 Optionally, you can put a couple of bay leaves in there while it cooks to give it a bit of an aroma. When the rice is cooked, set it aside in the mean time. When the chicken has baked for 20 minutes, take it out and leave the oven on. Remove the aluminum paper and sprinkle paprika over the chicken. Then pop back in the over for another 10 minutes. After those 10 extra minutes, take the dish out and the meal should be ready to serve. Serve one breast with a scoop of stuffing with a side of rice, and pour some extra cream of mushroom from the dish over the chicken and rice. Now you're all set.